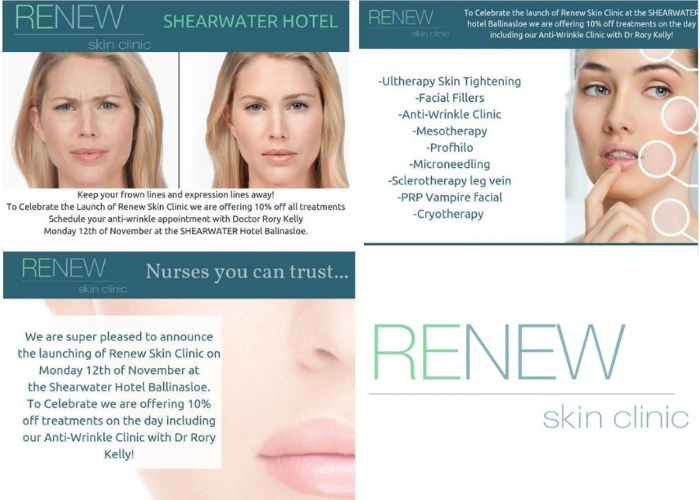 Owners Sinead Gallagher and Jeanette Dunne are delighted to welcome you to Renew Skin Clinic. As Aesthetic nurses with 15 years experience in the industry we have always believed that women and men want to look great for their age and so at Renew Skin Clinic our Nurses and Medical Practitioners always offer a natural realistic treatment program to keep you looking like you but better. We pride ourselves on discretion and privacy and in making your visit to Renew Skin Clinic as comfortable and as informative as possible. We are delighted to announce that Renew Skin Clinic is heading to the West! On Monday the 12th of November we will be opening in the Shearwater Hotel and Spa Ballinasloe Co Galway and offering 10% off all treatments on the day. Dr Rory Kelly will also be available on the day to carry out anti-wrinkle consultations and treatments. Dr. Kelly has a passion for aesthetic work and has steadily built up a private aesthetics practice over the last two years. He also acts as a medical educator at UCD. Micro-needling - Advanced medical micro skin-needling is a procedure that stimulates the skin to regenerate and repair itself naturally and safely, creating smoother, brighter, healthier, younger-looking skin. Ultherapy - a new approach to skin rejuvenation and skin-tightening. It is the only non-invasive procedure FDA-cleared to lift skin on the neck, under the chin and the eyebrow. Now also the only non-invasive treatment specifically FDA-cleared to improve lines and wrinkles on the décolletage. Ultherapy can help you achieve a fresher, more youthful look from your brow to your chest. Sclerotherapy - a safe and well-recognised treatment for thread veins on the legs. Sclerotherapy leg vein treatments involve a series of tiny injections leg veins which are delivered directly into the vein causing it to collapse and close, stopping the blood flow. Anti Wrinkle Clinic - Anti-wrinkle treatments are used to smoothen out the appearance of wrinkles, frown lines, forehead furrows and crow’s feet by relaxing the facial muscles. It can be used to smooth away existing lines or as a preventative measure to prevent the development of lines. The treatment starts to work within 3-14 days.